New Year's Eve is upon us! I'm sure I'm not the only still bewildered at how quickly 2015 has gone! I'm also sure that I'm not the only a little exhausted from all the festivities. Despite the exhaustion, I'm feeling very grateful and blessed for everything that has happened in 2015 and feeling pumped for 2016! Before the year ended and mum left for Indonesia, we squeezed one more meal, just the two of us. This time we were actually heading to Morley and were suddenly feeling very hungry and we just happened to pass Hanami, a place I've yet to try. We arrived at Hanami just before lunch time, once we were seated and was poring over the menu, we were surprised at how quickly this placed filled up! Mrs. M came back to Perth to play! Yay! It's only been one and a half months since she left, but it felt like a lifetime! When we planned a catch up, I knew exactly where I wanted to go, Pearl Restaurant in Applecross. I've heard raving reviews and repeat visits so I just had to try for myself. Before we arrived at the restaurant I can tell you there were lots of hugs and gossip to be had and it was going to continue throughout our dinner. Pearl Restaurant expert, Miss. D, also graced us with her presence. So we left the ordering to her! Below are her favourite Pearl dishes! The Pho Tai is a must have dish at a Vietnamese restaurant. This one impressed us, but it was not the most tasty or authentic pho tai I've ever tasted. They were very generous with the filling and that soup was clear as glass though! The Bo Luc Lac, I was told was a favourite dish at Pearl Restaurant and I could understand why. It was definitely the tastiest dish of the night. There were plenty of flavours going around and althought I hoped the diced beef were a bit more tender, it was certainly very enjoyable to eat. Another tasty dish at Pearl was their suon ga rang muoi (don't ask me how to pronounce it). This chicken ribs dish was flavourful and the chicken ribs were nicely battered adding a very nice crispy texture. Unlike the beef and the chicken, the broccoli and snow peas with crab meat sauce dish above was very delicately flavoured. Snow peas is one of my least favourite vegetables, so I didn't even bother to try it, but the broccoli drizzled with crab meat sauce was very pleasant. For drinks I couldn't resist their Ice Chendol. I was very full by the end of the meal and couldn't finish the drink, which I regret very much! This was a perfectly sweet and sinful drink and it made me miss Indonesia, where ice chendol is probably only 50 cents a pop! So what did I think? The dishes were all tasty, but not without faults. Perhaps I had hyped this restaurant too much in my mind, but I really didn't think this was the best Vietnamese I've had in Perth and the prices were a little steep for what they were. I guess the price was affected by location. So overall, not bad, but I won't trip over while rushing back here. Last but not least!!! Merry Christmas to you all! Hope you have an amazing festive season with family and friends and everyone you love! God bless everyone! Disclaimer: Prices and restaurant information was true and correct on 8th November 2015. Prices inclusive of 10% GST. The best type of meals are free! Mr. T's good friend celebrated their birthday by inviting a bunch of friends out for dinner. Their dinner was at Malaysian Dining Delights, so not only was I going to have a free meal, but I was going to try a restaurant I've never been to before! Double winning. I haven't heard much about this restaurant, but when we arrived I could see that I've been missing this from my life because not only was it packed, there were people lingering outside the door waiting for a table. Fortunately for us, we had reservations, so we walked in as if we were VIPs! Straight away, we started stalking other diners' tables to see what they were eating. We were immediately in awe of the Kerabu sauce fish and the special tofu tower. Unfortunately for me, on this particular night I was not equipped with my camera and my phone ran out of battery so I did not take photos of the food (gasp). Fast forward a week later, I decided my weekly family dinner will be held at Malaysian Dining Delights. From the week before I found out that the kerabu fish had to be pre-ordered, but I didn't find out what it was called, so I mistakenly pre-ordered the assam sauce fish. Anyway, enough of my jibber jabber, here's what we had during my second visit to Malaysian Dining Delight in a week. A few months back, when I first ate at Flo Espresso and posted the photos on Instagram, my sister started nagging me to take her there. The fact that I kept raving about it did nothing to defuse her nagging. When she finally arrived in Perth, she would not stop bringing it up. So then, on one of my days off, we finally made the trip to Flo Espresso. Flo Espresso is relatively new, but it certainly has made a name for herself. We arrived at about 9 am and it was packed with office workers picking up their caffeine hit, the line was out the door. Fortunately, we were still able to get a table. Flo Espresso doesn't have a menu, everything they serve is on display at the counter, but we didn't need to look to know what we were going to order. Ramen, the five lettered word that evokes joy in my soul. Okay, that might be exaggerating, but I do love my ramen. I love Japanese food in general, as you can tell from the past three posts! My latest Japanese food obsession is Freshmade Cafe ramen. Before my first trip here, I've heard mixed reviews, some were impressed, some not so much. By those who didn't like it, I was told it was not authentic and that Nao or Dosukoi were still better. All these reviews made me want to try it even more! About six years ago, my one and only sister moved back to Jakarta permanently. I didn't realise then how much I was going to miss having her around. We weren't too close when we were younger, but distance makes the heart grow fonder and now I look forward to seeing her when I visit Jakarta and when she visits Perth. In November she visited Perth for two weeks. I was beside myself in excitement and was really looking forward to act as a tour leader and introduce her to the awesome food scene that has emerged since she lived here. Musashi didn't quite make it to my tour list, but mum insisted I take her and my sister there. Being the amazing daughter that I am, I took them there straight away! Well, no regrets! 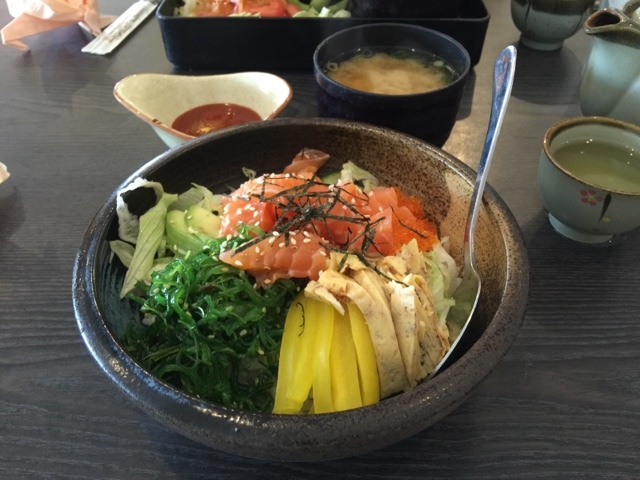 We first heard of Musashi from my sister-in-law who regularly lunched here during her stint of work in Joondalup. Now, we visit this place as often as possible! As you can see from the photos and the captions, each portion is generously sized and what's more outrageous are the prices! There are fewer and fewer places in Perth offering up delicious food for under $10 per person, so based on on price alone this place is definitely worth a try. On top of the great prices, their food is fresh and tasty. My personal favourite is their fish teriyaki. I love how the batter is still crispy even after being drenched by the flavoursome teriyaki sauce. Their karaage is also rave-worthy, very crispy without the oily aftertaste. They also offer ramen, but only available during lunch time on Mondays-Wednesdays. Hopefully they will start serving them on other days too, because I can't wait to try them. Overall, Musashi is a great option for a casual lunch or when you want a delicious and satisfying meal on a budget. Unfortunately they are not open on weekends, so plan your sickie now so you can go try it. Disclaimer: Restaurant information and prices were true and correct on 30th Oct 2015. Prices were inclusive of 10% GST. This is a true love story. I first came to know Buen 151 and their chirashi sushi when my sister's friend introduced us. The restaurant is large for a Japanese restaurant, but rather poorly decorated and not so welcoming. We persevered despite unshakable doubt of the quality of the food. Once I opened the menu, nothing seemed to stand out except for the chirashi sushi. This was the first time I've seen chirashi on a menu, I'm sure because of my own ignorance. 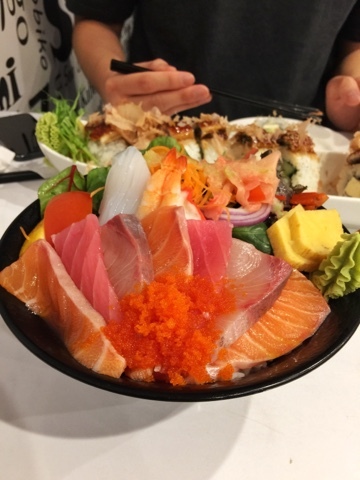 I was intrigued at the idea of a bowl of sashimi on top of sushi rice, so I ordered it. I fell in love and I fell hard... with chirashi sushi. I don't usually have cravings, but I crave chirashi and I have to say, in my opinion, the best one is still at Buen 151. A long and difficult day at work can get me pretty down, but on a particular Monday night, nothing was going to dampen my excitement of catching up with friends and trying out a restaurant I've been wanting to try for a while. That restaurant was Nunam. I've driven past it many-a-times, have seen photos and have read positive things about it, I couldn't wait to try it for myself. When I arrived at the restaurant, I was a little surprised by the atmosphere. The place felt a lot more "fine-dining" than I expected and I instantly felt under-dressed. However, my worries were quickly squashed as the maitre'd greeted us in a very friendly manner and efficiently seated us and brought water. As some of you may have realised the layout of this blog has changed slightly! As I was moving things over to the new layout, I realised this post has yet to see the light of day! I then also realised that I don't remember the flavours of the dishes we had! =( Anyway, below are the photos of the dishes we had and from what I can remember, the photos don't do them justice. The Korean fried chicken trend has taken Perth by storm. Well, who wouldn't love a crispy deep fried battered chicken smothered with tasty sauce? One fried chicken restaurant that has caught my eye was Sun BBQ. I first saw pictures of their fried chicken on Inexology's Instagram feed and it looked amazing! I couldn't wait for the opportunity to try it out for myself. That opportunity finally came not too long ago. Just to illustrate how keen I was, Sun BBQ opens at 4pm on Saturdays, I was outside the door by 3:50pm! What I didn't realise was, they also have a cafe, Sun Cafe, and they open much earlier in the day! So I think I would've been able to arrive much sooner! Anyway, we were quickly seated and given menus to ponder over. After we ordered they served this small bowl of crispy snacks. I'm not sure what it is or what it's made of, but it was tasty. Well it better be, seeing as it was covered in sugar. 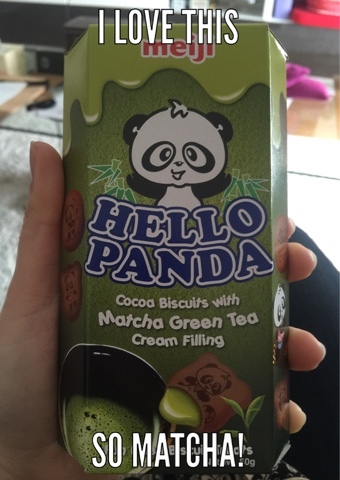 The sweet and savoury mix of flavours was nice, but the texture was a little tougher than what I would've liked. What to do with excess Tim Tams? This was the question I was asking myself when I realised that I had bought too many Tim Tam bulk packs! When I bought them, I had the full intention of bringing them to work or to youth group to share, and I did! I just bought too many. I thought about bringing them some more, but I wanted to seem like I was bringing them something totally original, rather than just something out of my pantry. 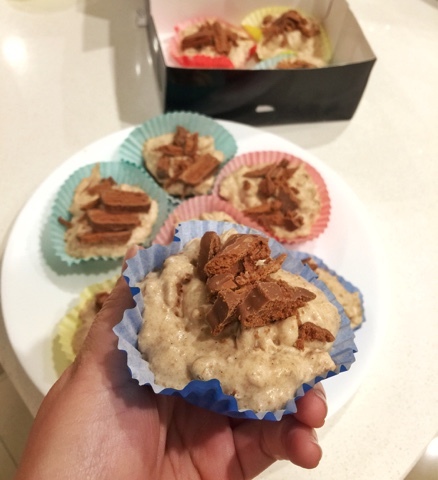 This brought me to research Tim Tam recipes and the one that was the simplest and seemed the tastiest was the Tim Tam Cheesecake. 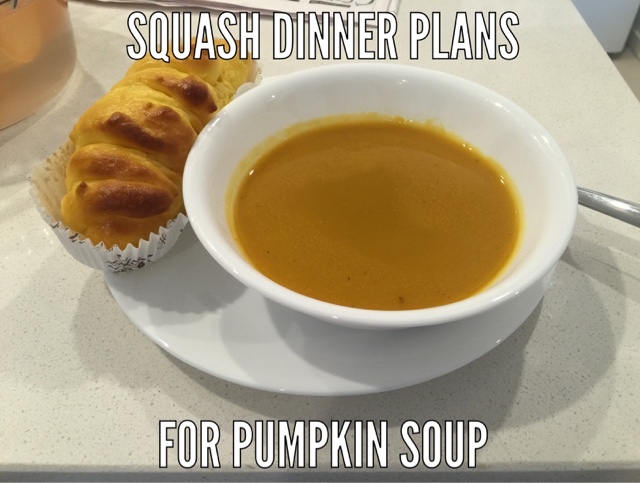 I borrowed the recipe from bestrecipes.com.au and tweaked it ever so slightly to suit my time and ingredient limitations. Below is what I came up with. In a mixing bowl, mix together the thickened cream and sugar. To the mixture add the cream cheese, and vanilla essence and mix well with the beater. In a separate small bowl mix the boiling water and the gelatin. Stir well, until the gelatin has all dissolved. Add the gelatin into the cream mixture and mix well. Add the roughly chopped tim tams into the cream mixture and mix well. Once ready to serve, chop up the remaining Tim Tams and sprinkle on top for decoration. One word people may use to describe me would be, punctual. Tardiness is actually one of my biggest pet peeves. Personally, I feel everyone's time is valuable, so if you've made a plan to be somewhere at a certain time, be there on the dot, or even earlier! So, I get very anxious if I'm running late, I usually end up calling the other person every few minutes to give them live updates on where I am and how long I'll be from arriving. Mr. T does not have my standard of punctuality, but on this particular Saturday morning he forgot the time on an invitation and we ended up arriving one hour earlier. So on this particular occasion Mr. T was inadvertently more punctual than me! Making his mistake into a triumph, we decided to drive to a not so far cafe, which I've been wanting to try, Sapore Espresso Bar. Those gourmet shakes have been calling me on social media and I wanted to try one for myself. IS Donburi is certainly the place to be on a Saturday night. Even though there's nearly always a queue for dinner there, customers don't seem to mind one bit about waiting to be seated. I think that's a testament of the quality of food and great flavours on offer at IS Donburi. I, for one, am always excited at the prospect of going to IS Donburi. On this fine Saturday night, we only queued for about 15 minutes before being given a table. For the past few days I've been craving for chirashi, so I knew immediately what I was going to order. As there was a large crowd, we were expecting to wait for a while for our food, which we didn't mind at all. But, what made us love IS Donburi even more was the fact they served us free miso soup! Such a bonus. There's just something about waking up on a Saturday morning and knowing you're going to be in great company while checking out a hip cafe! Well, that was the amazing feeling I had on this particular Saturday morning. Due to our busy schedules, we had to plan this brunch three weeks in advance, but it was certainly worth the wait. We had decided on The Hardware Store cafe, a place that had not made it onto my radar yet (not due to lack of popularity though!). After checking them out on social media and their website, I already knew what I was going to try and I could hardly wait. Friday, the first day of my weekend, time to loosen the belt, whip out my food bucket list and go food hunting. Last Friday, Mr. T asked me to join him for lunch, I was more than happy to oblige, and as he was working in Fremantle, we decided on hotdogs at Run Amuk. We've been here once before, but made the mistake of having snacks first at the market, leaving very little room in our bellies. This time we came prepared, minimal breakfast for maximum hot dog intake. In fact, my breakfast was so minimal, by the time we arrived at Run Amuk I was a wee bit hangry and my stomach took over my brain. Before we even sat down, I decided on fries, a hotdog and milkshake! Sure this was probably a week's worth of calorie intake in one sitting, but there's no time for regrets. Ever since getting engaged, Mr. T and I have decided to attempt to become healthier. For the sake of both our health and also, to look amazing on our wedding day. Really, just to look amazing on our wedding day. Well, on this particular Saturday morning, we decided on a nice jog around South Perth foreshore. By jog I mean walking at a faster pace than usual. It was such a beautiful day for it too! Spring has truly sprung, but it was still cool enough to enjoy the sunshine without feeling like we were being deep fried. Right after our lovely jog, we decided on The Sarapan for brunch, a place we've been wanting to try for a while but always seems to get missed. Well not today! One of the blessings of working the night shift is the ability to enjoy a great breakfast to start the day! Well on this particularly beautiful morning Miss. A and I headed straight down to Harvest Espresso to check out their new Spring menu and for a good old catch up face-to-face! We arrived at 9am on the dot and thankfully the cafe was only half full, which meant we were able to get awesome seats right next to the window. We got straight down to business, carefully read the menu and ordered! One of my favourite group of friends to catch up with is my undergrad gang! We don't see nearly enough of each other, but when we do, it's like no time has passed. Life has pulled us in all different directions, so it's always great to touch base and see everyone. This time I initiated the catch-up and I knew exactly where I wanted us to go, Hermosa in Wembley! So one day in late July the boss walked into the store and said, "we should have Christmas dinner." We all pointed out that he was either too early or too late for that. So we settled for Christmas in September dinner instead! I played no part in choosing the restaurant that we'd go to, but everyone agreed on Fratelli Restaurant in Sorrento. Having lived South of the river for most of my life in Perth, I had no idea this place existed or where it was exactly. This made me even more excited to try it! The restaurant is located on West Coast Drive in Sorrento, just off the beach. As the place is upstairs, it gets the advantage of the beautiful beach scenery, although we missed the sunset when we arrived. Nonetheless, this place has been blessed with great views! Mr. T and I have some news, we're engaged! Dinner at The Trustee was the start to the special night. I was actually the one to plan this dinner as I wanted to use a gift voucher that was near expired! So this night was not only special because of what happened, but also because of the food and also because we paid next to nothing for the dinner! This night couldn't get any better! Literally! The reason I chose The Trustee was to try their dessert degustation and it did not disappoint. There are rare occasions where I wake up and feel like eating healthy. On one of those rare occasions, my mind immediately thought of Flora & Fauna. Photos of food from F&F have been popping up everywhere and everything looked so colourful and healthy! So, Mrs. M and I made a trip to F&F, and to top of my healthy stint, I walked there! Which turned out to have been a horrible idea as it started pouring halfway through the walk. 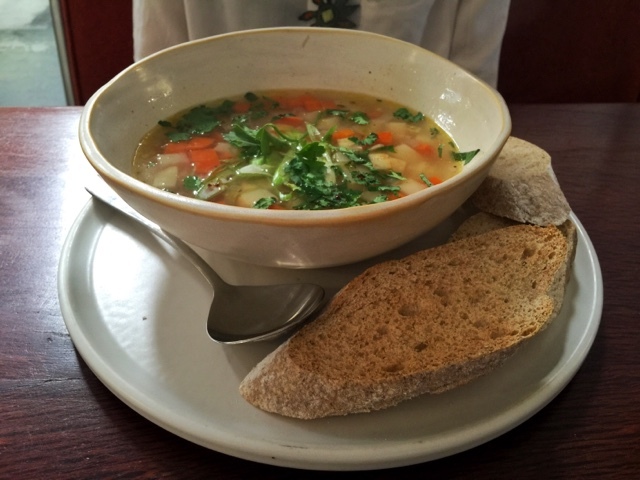 Despite the weather, and F&F's very tiny cafe, we both still really enjoyed the food! My two favourite four-lettered words are "food" and "sale". 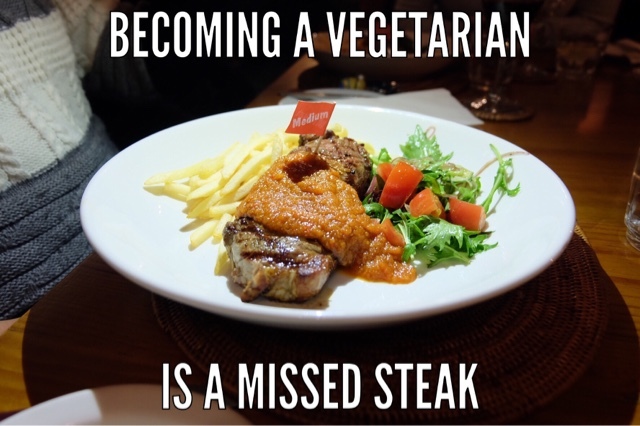 So when a friend told me Zebras African Steakhouse has steak specials every Wednesday, we quickly made reservations and made our way down to Bicton. The night became merrier than expected, what was supposed to be a party of four, turned into a party of 11! Zebras African Steakhouse is a large, but inconspicuous restaurant, tucked away on Point Walter Road. As we made our way into the restaurant, we couldn't help but feel we just walked into Africa, with the many and appropriate decorations. The Red Chair Cafe in Subiaco claims to serve the "Best Laksa in Perth". You know what? I think they're right! This gem was another find by Mr. T, who chanced upon this cafe whilst working at a client's office nearby. Ever since then, we've been back numerous times to enjoy their delicious Laksa Lemak. As my family originated from Indonesia, there is a special spot in our hearts for Indonesian food. 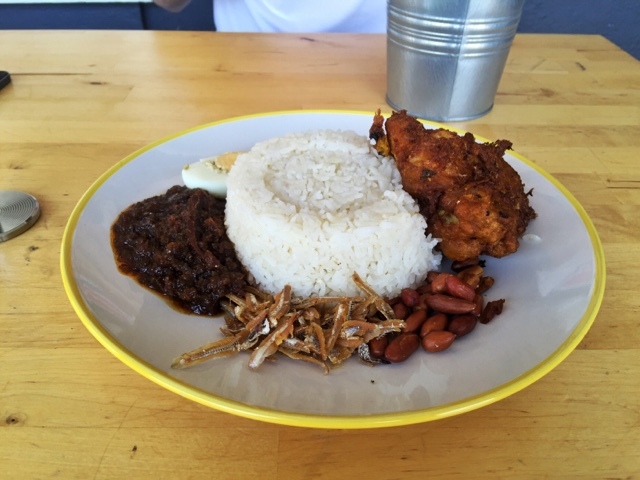 There are a few Indonesian restaurants around Perth and one of our favourite has to be Sparrow Indonesian Restaurant. This place must be a favourite of a lot of other people as well as there are always large crowds dining in and buying take-away every day and night they are open! Perth is home to some pretty amazing Thai restaurants. Two of my all time favourite Thai restaurants has to be Vipa Thai in Myaree and Red Basil in Victoria Park. Only recently was I introduced to Little Ying Thai. Mum was treated by a friend to dinner at Little Ying Thai, and she came home raving about the food. She actually wouldn't stop talking about it until we all tried it. So we picked a date, reserved a table and carpooled to this small and inconspicuous Thai restaurant. Little did we know, this place already has a large number of loyal and returning clientele! It was definitely a smart move to have made a reservation ahead of time as the small restaurant was filled to the brim already when we arrived. They actually had to turn away customers who weren't willing to wait. Our three day trip down south was accompanied by pouring rain and cold weather. But, we still enjoyed and loved every minute of it! On our second day, we ventured down to Margaret River from Dunsborough. We actually thought we were being really organised by reserving a table two days before our arrival, however they lost our reservation anyway. But, it worked in our favour, we were given a table outside which many people were avoiding due to the bad weather. However, for the hour we were there, there was nothing but blue skies. When I told people my family and I were going down south in the middle of July, their response was one of confusion and disbelief. Most responses were "But, it's going to be cold? "or "Why now, in the middle of Winter?". Well they were right to be confused. Our three day trip down South was accompanied with gloomy weather and heavy rains. But, that didn't stop us from having fun and enjoying good food! On our drive to Dunsborough, we made a lunch stop at Mojo's Restaurant. This place was chosen, not because we've heard of it, or were dying to try a dish at the restaurant, but, simply because we had an Entertainment Book voucher! In my family, it's very rare that my parents would eat two Western food meals in one day, I wanted to have dinner somewhere fancier than a Chinese restaurant, but would cater to the Asian needs of my family. That's how we ended up at Barque! Let me start by praising their impeccable service. I called them a few times to make changes to my reservation, the number of people and the time, and they were more than accommodating. As we had a party of nine, we were given their private dining room, which was really lovely and made the dinner that much more special! Thanks Barque! Anyone remember Lily Aldrin from How I Met Your Mother? Well, I'm the Lily Aldrin in my family! I love birthdays! I love my birthday, I love Mr. T's birthday, I love my parents' and siblings' birthdays! Heck I love my neighbour's, who I don't even know, birthday! Well, two weekends ago was my birthday. It happened on a Sunday, which meant I had to be at work, so obviously, I made everyone celebrate it on the Saturday. Before today I've never tried empanadas. I first heard of empanadas on Modern Family, where Gloria's empanadas were rejected by Manny because his, then, girlfriend told him it has too much saturated fats. Since then, I've wanted to try authentic empanadas. I've seen pictures and imagined it was similar to a chicken pastie. That all changed when Mrs. M told me I had to try Las Empanadas and right now they're conveniently located at Food Amongst the Flowers in Claremont Quarter. The past couple of weeks have been crazy hectic! What with my birthday and my parents and aunty visiting from Jakarta, we've had a lot of reasons to celebrate, but, that means I've been neglecting my blog a little bit and I've missed it! Well, I'm back and I'm here to write about OEC Bob cafe, a new-ish cafe on Newcastle Street, Northbridge. With the Tuck Shop and Old Crow, so close by, this cafe has big name competitions! My dad and I visited OEC Bob on a Friday for lunch. Just before going, I had a quick squizz on Zomato to see the rating and was a little apprehensive after seeing it was rated lowly. However, my curiosity got the better of me and we headed here anyway. Before arriving we had no idea what sort of cuisine was on offer and when we arrived we were even more confused as the decor was very eccentric! After looking at the menu, it became clear they served Western breakfast dishes and Japanese lunches. So last week, I did something I've never done before... brunched alone! With my work schedule allowing me only one weekend day off, it can be difficult to plan things with friends and family who are on a 8-5 Monday to Friday schedule. So I took the liberty of going to brunch by myself... and I loved it! I decided on a place I've always wanted to try, but no-one else, in my circle, seemed interested in! That place was the City Farm Cafe in East Perth. I loved the garden atmosphere, it was kind of like brunching in someone's backyard.